Aligarh, September 9: Professor Samir M Rammal of the University of Birzeit, Palestine, an old student of AMU, who graduated from the Department of English, Aligarh Muslim University (AMU) in 1973 had an interaction with students and the faculty of the department. In a very interesting talk, he dwelt on problems of translations, novels of Thomas Hardy and Arabic Literature in English. Prof Samir has been associated with a United Nations project on ‘The Translation of a Volume on Economics of Palestine’. He made a neat distinction between functional and ideational translation and emphasised the need to develop a proper terminology specially when translating legal and economics text. He told the students how he read all possible works of Thomas Hardy, when he was a student and how he coped with challenges of academics in Palestine. Students of the Department of English participated actively in the discussion that followed the lecture. Prof Samir also shared fond memories of his teachers and class mates when he was a student in AMU. 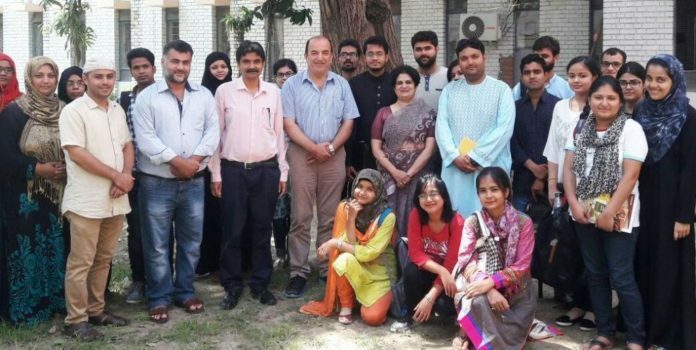 Prof Asim Siddiqui, who is looking after the Alumni Committee of the department, asked the students to interact and benefit from the distinguished alumni of the Department of English spread all over the world. Prof Seemin Hasan (Chairperson, Department of English) introduced the distinguished speaker and thanked him for sparing his valuable time for the interaction.